Dreamtime - Commentary Inspired By Bob Dylan's Theme Time Radio Hour: Episode 53 - Will There Be Any Yodeling In Heaven? Episode 53 - Will There Be Any Yodeling In Heaven? We're back again with another show from your other home for dreams, schemes, and themes. We've been gone for awhile, so we've got lots to talk about on today's show, including the end of Theme Time Radio Hour Season 2, when we can expect Season 3 to start, what Dreamtime will be up to during the Theme Time hiatus, and hey, bar the door, Katie! We're also going to tell you about the first Dreamtime Constant Listener contest, where one lucky listener - that might be you - will win a copy of Sid Griffin's book, Million Dollar Bash, as well as some assorted Dreamtime bling! All that and more on Episode 53 of the Dreamtime podcast. And because we wouldn't be Dreamtime without some Theme Time-inspired music, we're also taking a stroll today through the sadly neglected world of yodels and yodeling, including Alpine yodels, blue yodels, Hawaiian yodels, blackface yodels, country-western yodels, and Drake's Creme-Filled Chocolate Cake Yodels. To get us started, a musical lesson on yodeling from Mr.Goebel Reeves, also known as the Texas Drifter. From 19 and 34, The Yodelin' Teacher. 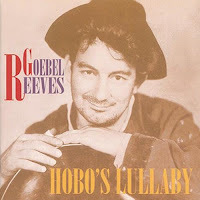 Goebel Reeves is probably best remembered for writing one of Woody Guthrie's signature tunes, Hobo's Lullaby, a song that became so associated with Woody that most people believe he composed it himself. You might think you were listening to a dialogue in The Yodelin' Teacher, but Reeves is actually performing both voices. Most of Goebel Reeves career is a mystery, and there's no direct evidence that he ever performed in blackface. But he claimed to have barnstormed through the South with Jimmie Rodgers during the early `20s, and to have taught Rodgers to yodel. And The Yodelin' Teacher sure sounds like a blackface routine Reeves and Rodgers might have developed together as an act for the Medicine Show circuit. When yodeling, blackface, and Jimmie Rodgers are mentioned, there's always another performer who needs to be acknowledged. You know who we're talking about, we did an entire Dreamtime show on him. Here's our ghost in blackface, Emmett Miller, performing the original Lovesick Blues. From 19 and 28, Lovesick Blues performed by Emmett Miller, using his trademark yodel. Twenty years later Hank Williams would record Lovesick Blues, and have his first #1 Country Single hit, ironically one of the few cover songs he ever recorded. Let's take a break and discuss some Theme Time Radio Hour and Dreamtime news. As I would guess all of my listeners know by now, Theme Time Radio Hour closed its Season 2 with the "Cold" show broadcast on April 2nd. Mr. D. said in his announcement that they'd be back "real soon" with Season 3, the deejays on "Deep Tracks" and XMX - the two channels where Theme Time is being re-run - are saying the show will be back in "a couple of months," and the New York Daily News has made the unlikely claim that the show will be back September 19th (I say unlikely because September 19th is a Friday), but the bottom line is that XM Radio has yet to announce an official return date. Send us an email - dreamtimepodcast@gmail.com - and give us your pick on the date when Theme Time Radio Hour will return with Season 3. Please make sure to put "Dreamtime contest" in the Subject line. The contest ends when the official announcement of Theme Time Radio Hour Season 3 is made by XM Radio. 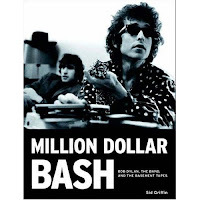 Our winner will receive a copy of Sid Griffin's great book on the Basement Tapes recording sessions: Million Dollar Bash, personally inscribed to you by the Dreamtime team; and a CD of our most popular show to date, Poetry Readings with Your Host, Bob Dylan from Season 1 of TTRH. Standard disclaimer stuff: One entry per email address. Contest ends when the official announcement of Theme Time Radio Hour Season 3 is made by XM Radio. In case two or more entries has the right date, the winner will be randomly selected from the Dreamtime hat. If no one selects the exact date, our drawing will be randomly selected from all the entries. Employees of XM Radio, Big Red Tree, Gray Water Park Productions, or the Dreamtime team - especially the Top Cats - are not eligible, and their cat food will be taken away if they're caught. So there you have it, friends, the first annual Dreamtime Constant Listener contest. All the info is on the blog, including links to our email. Enter early, 'cause there's no way of telling when XM will make the announcement that Theme Time Radio Hour is starting up again. I think it's time for some more music, and here's one of my favorite yodeling teams, The Dezurik Sisters, better known on their radio show as as The Cackle Sisters. Yodeling wasn't just limited to yodeling when it picked up popularity among country-western artists in the `30s. The term came to stand for any vocal trick in a song, especially animal sounds which might include a barnyard full of dogs, cats, mules, and birds. Bird imitations were a Dezurik Sister speciality. We "listened to the birds and tried to sing with the birds," sister Carolyn once said. Here's the Dezurik Sisters with The Arizona Yodeler. Cliff Carlisle with a song so nasty that he released it under the name "Bob Clifford." In fact, his label thought the song so nasty that they marketed it as a race record, directed to a black rather than white audience. Next on the agenda is some technical Dreamtalk I'll try to make as quick and painless as possible. First: How to subscribe in iTunes. While the Dreamtime feed is still broken in the official iTunes store, you can still easily subscribe to the Dreamtime podcast by hustling over to the Dreamtime blog at dreamtimepodcast.com, click on the "Got iTunes" button you'll find in the upper right cornerand zippo! you're subscribed in iTunes and will never miss an episode of Dreamtime. Second in line: In Dreamtime's constant race to be the coolest kid on the block, we've created a special Dreamtime account on Twitter. One of the most popular sections of Dreamtime is the daily Theme Time Radio Hour News & Views column that you'll find over to your right, too, when you come visit the blog. If you're a Twitter aficionado and want to follow the TTRH News & Views column over there as it (almost) breaks, here's your opportunity. Go to Twitter and search for DylanTweets, all one word, and TTRH news will be flowing into your computer, cell phone, or whatever you're using to Twitter. If you want to follow me, btw, my personal Twitter account is FredatDreamtime, again all one word, but I have to warn you up front, I'm pretty boring. I promised a little Hawaiian yodeling and the honors go to one of the greatest of singing cowboys, Roy Rogers. I'm about 10 years younger than Mr. D., and what Gene Autry meant to him, Roy Rogers meant to me, the ultimate in Cowboy Code Coolness. My mother totally bummed me out when I was about 8, telling me that Roy Rogers had been in jail for murdering his wife, apparently pre-Dale Evans. She didn't have any explanation about why Roy was romping around on Saturday morning television instead of being behind bars somewhere, but the story cast a shadow on Young Fred, equivalent to when a classmate told me that Superman had shot himself. 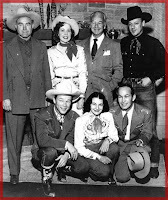 It wasn't until years later that I realized my mother - never a fount of accuracy - had confused Roy Rogers with Spade Cooley, who claimed during his trial that Roy Rogers had had an affair with his wife, who Cooley subsequently murdered in front of their 14-year-old daughter. Here's someone who didn't murder his wife, I'm happy to say, Leonard Franklin Slye, better known to us all as the King of the Cowboys, Roy Rogers, riding on the 1940s Hawaiian craze with the song, Hawaiian Cowboy. No one knows how Hawaiian music and yodeling got intertwined, although the best guess seems to be that the unique Hawaiian version of yodeling sprang from a blend of Hawaiian chants, Christian hymns promoted by missionaries, and yodeling from immigrant cowboys. As Mr. D. says, all these things have roots. We're winding up today's Dreamtime with our title song, a question that all True Fans of yodeling will ask Saint Peter before stepping through those pearly gates. From Theme Time Radio Hour favorite, Bob Wills & His Texas Playboys, with vocals supplied by the McKinney Sisters, Will There Be Any Yodeling in Heaven? Will There Be Yodeling in Heaven? The answer, of course, is yes. Because if there's no yodeling in heaven, then what's a heaven for? Before we close the show, we want to give a big "Thank you" to everyone who has started their Amazon shopping through the Dreamtime blog. There's not a lot of cost to doing Dreamtime, but it does run us a few shekels a month. And it's nice to know there's people out there who think enough of what we're doing to see that a little money comes our way via Amazon or Paypal. It's very much appreciated, and thanks again. 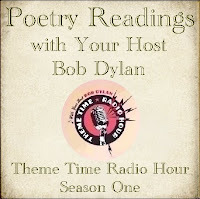 And finally, another big "Thank you" from the Dreamtime team to our audience for making our last episode - Poetry Readings from Season One of Theme Time Radio Hour - our most popular show ever. If you liked that one and are new to Dreamtime, you might want to take a tour through our archives and download Episode 35 - Cooking and Drinking with Bob, which covers most of the recipes Our Host told us about during Season One - everything from barbecue sauce to Figi Pudding. Other shows that have been hits with our audience include The Lost Theme Time iPod; Working for the Yankee Dollar; and Back Where I Come From: The Roots of Theme Time Radio Hour. 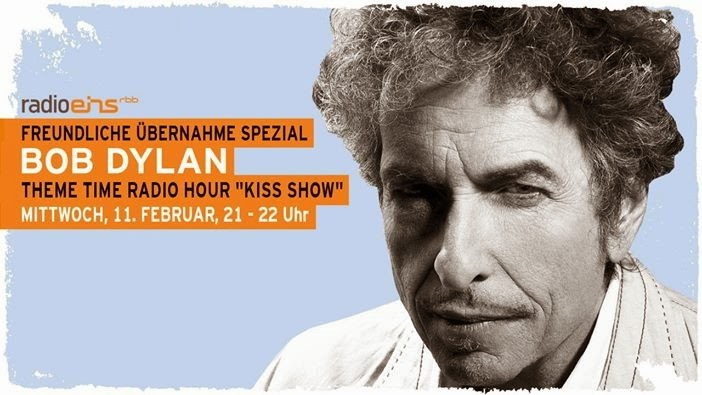 But with 53 episodes the chances are that whatever you like about Bob Dylan and Theme Time Radio Hour, we've talked about it on Dreamtime, so go check out our back catalog. And if we haven't talked about something Theme Time Radio Hour-related that you'd like to hear on a future episode, let us know. Some of our best shows have come from listener suggestions. With Theme Time Radio Hour on hiatus, Dreamtime is moving to a once-a-month schedule for the duration. We'll be back in May with a new show. Thanks as always for listening, and remember to enter our Dreamtime Constant Listener Contest. When will Season 3 of Theme Time Radio Hour start? only the Shadow - and Eddie G. - know, but maybe you can guess.